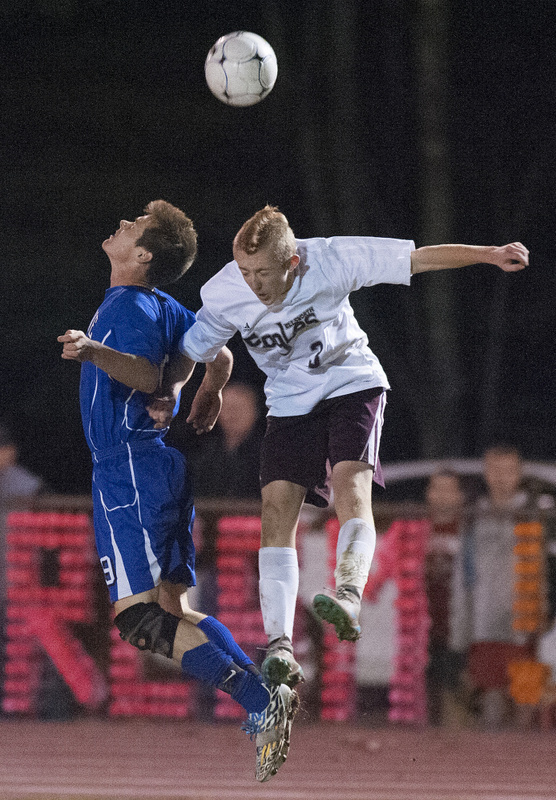 Trevor Hubbard, Luke Peabody score in victory to send Eagles to Class B state championship game. 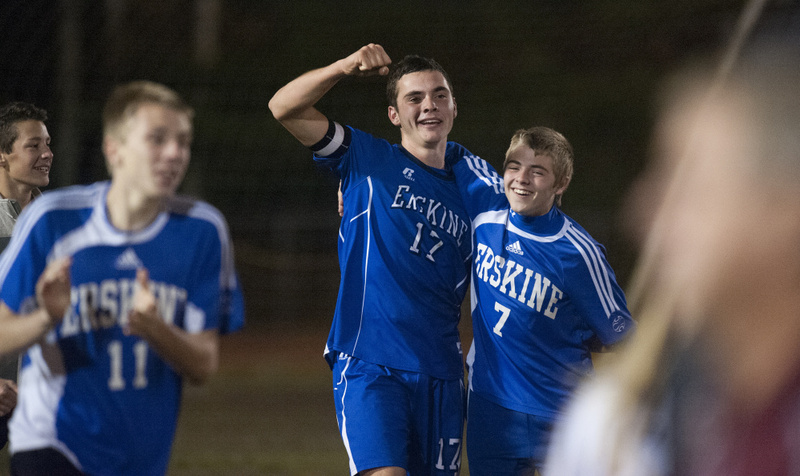 ELLSWORTH — The Erskine Academy boys soccer team’s run through the Class B North playoffs included four road trips, wins over the top three seeds, and two games decided by penalty kicks. Now, the Eagles are going to their first state championship game. 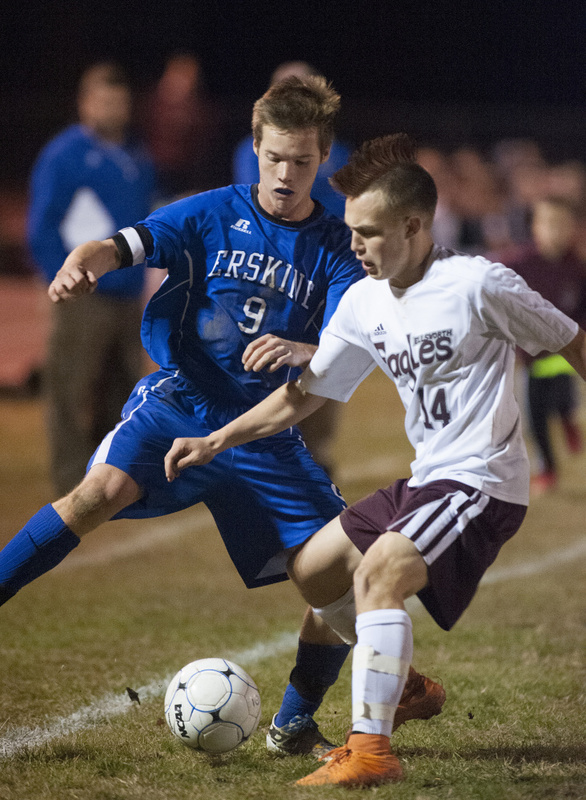 Erskine scored a goal in each half, and played tremendous defense against top-seeded Ellsworth and it’s flip throw master, Lukas Firestone, taking a 2-1 win in the regional championship game Wednesday evening. Erskine, the No. 10 seed in the regional tournament, is now 14-4-0, and will face Yarmouth in the Class B championship game Saturday at 5:30 p.m. at Portland’s Fitzpatrick Stadium. Yarmouth beat previously unbeaten Maranacook, 3-2, in double overtime Wednesday evening. 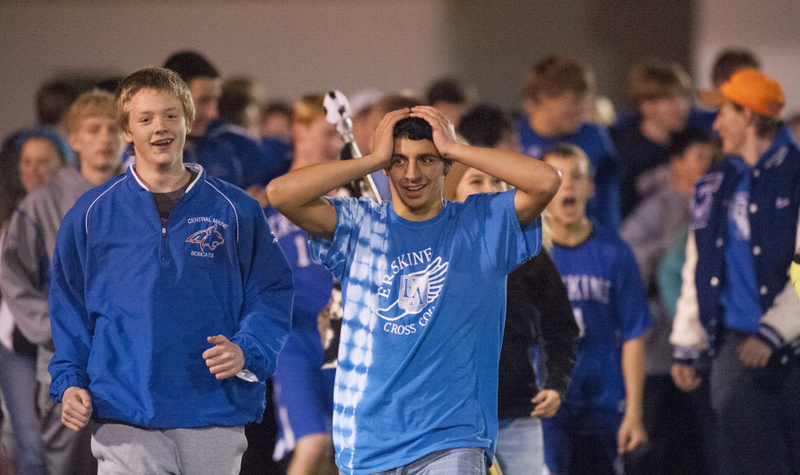 Ellsworth, the defending regional champion, ends the season at 13-3-1. “We knew they were going to crash the net. We just came in and we played our hearts out. That was going to be our game plan,” Erskine goalie Denver Cullivan said. 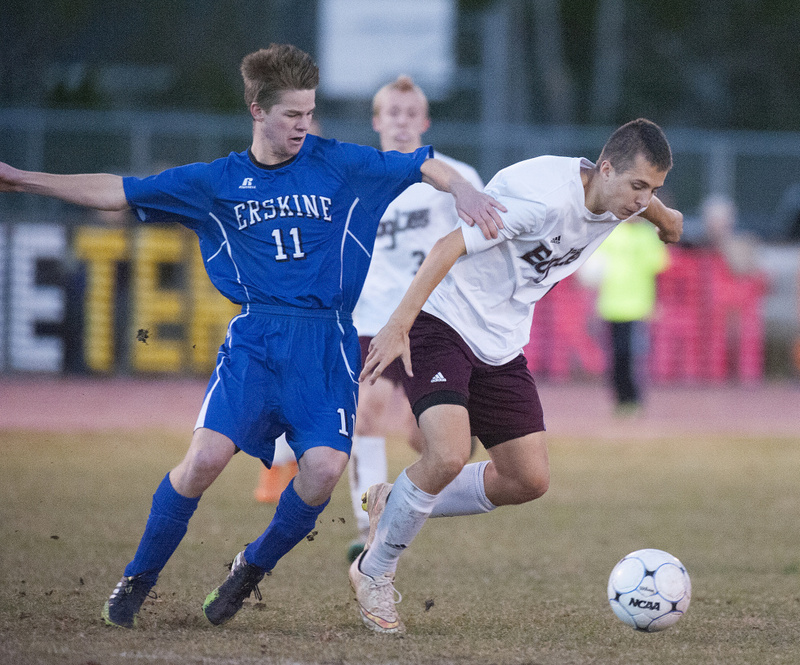 Erskine knocked off No. 7 Mt. Desert Island, No. 2 Winslow and No. 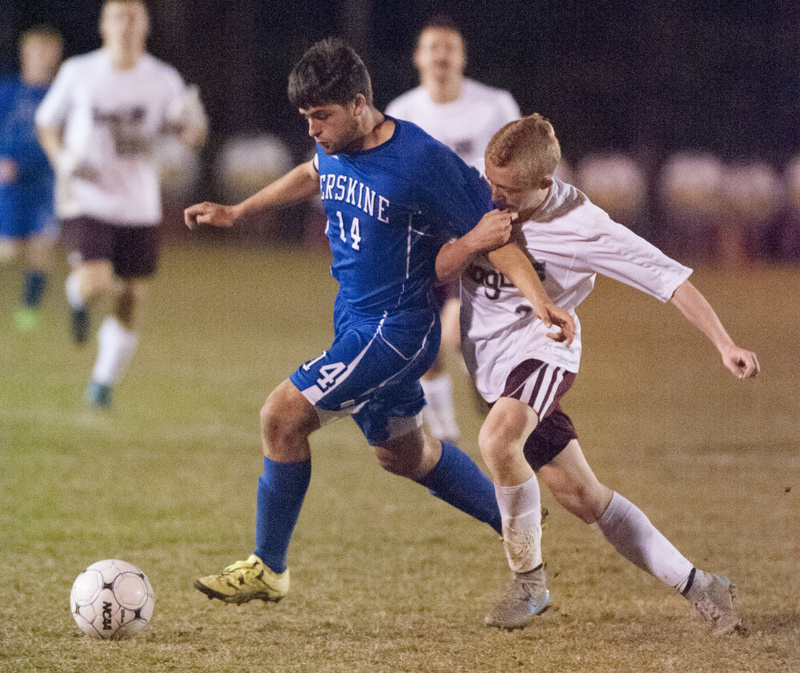 3 Presque Isle to advance to Wednesday’s regional final, and jumped ahead of No. 1 Ellsworth early. 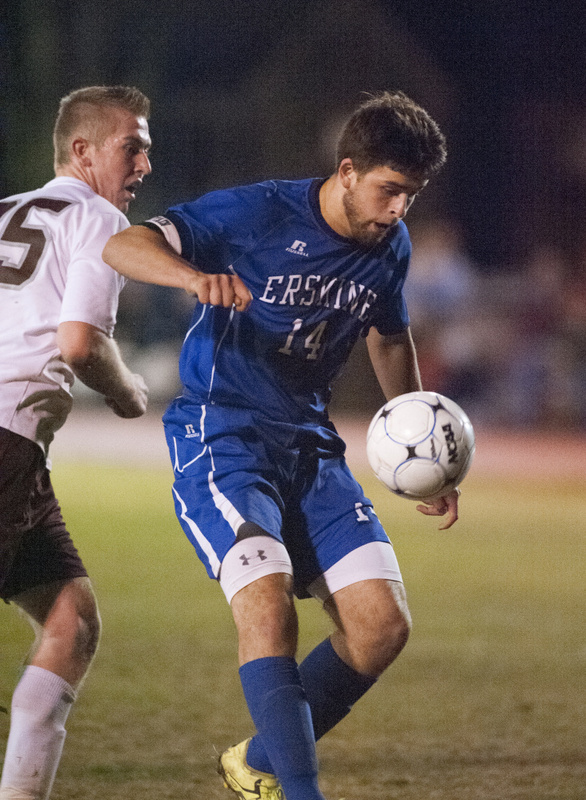 Trevor Hubbard’s goal off a Luke Peabody deflection with 35:47 left in the first half gave Erskine a 1-0 lead. “Luke Peabody did a good job deflecting it, and I was right there, and I just put it in,” Hubbard said. In Firestone, Ellsworth has a player who can turn a throw in anywhere near the box into a scoring opportunity. Firestone’s bicycle flip throws are strong and accurate, and set up Ellsworth headers for goals throughout the season. To counter Firestone’s throw ins, Erskine put two payers on the goal line with Cullivan, who was looking for a clear shot to punch the ball out or catch it. “That’s something else. (Firestone’s) the best in New England at flip throws. I’ve never seen anything like that. That’s not even a cross. He has an amazing talent. That was difficult,” Cullivan said. The flips throws weren’t something Erskine could practice, other than throwing the ball at Cullivan so he could work at punching it out as far as possible, Erskine coach Phil Hubbard said. The Eagles also changed their offensive attack to try to counter Ellsworth. “We usually play a 5-4-1 (formation). We decided we had to go after them and keep them off those flip throws, so we went to a 4-4-2,” Coach Hubbard said. The move worked with 16:25 left in the second half, when Peabody broke in alone after long pass and fired a hard, low shot to the left corner of the net past Ellsworth keeper Bruce St. Peter, giving Erskine a 2-0 lead. “We usually play more of a defensive game. We brought it right at them. That plan worked today,” Trevor Hubbard said. 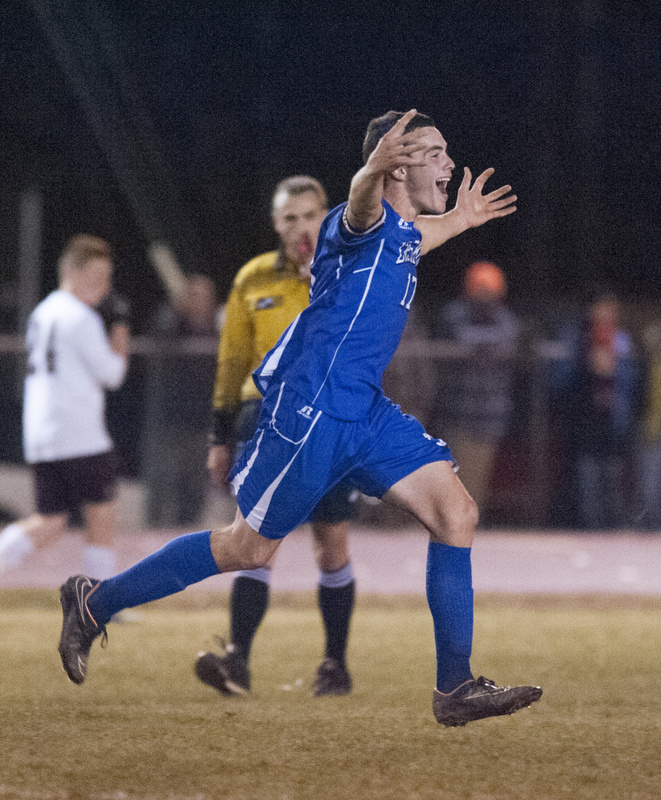 Ellsworth got on the board with 12:14, when Colby Clarke scored on a penalty kick after Erskine was called for a hit in the back in the box. Clarke’s shot went to the lower left corner of the net, and Erskine’s lead was 2-1. 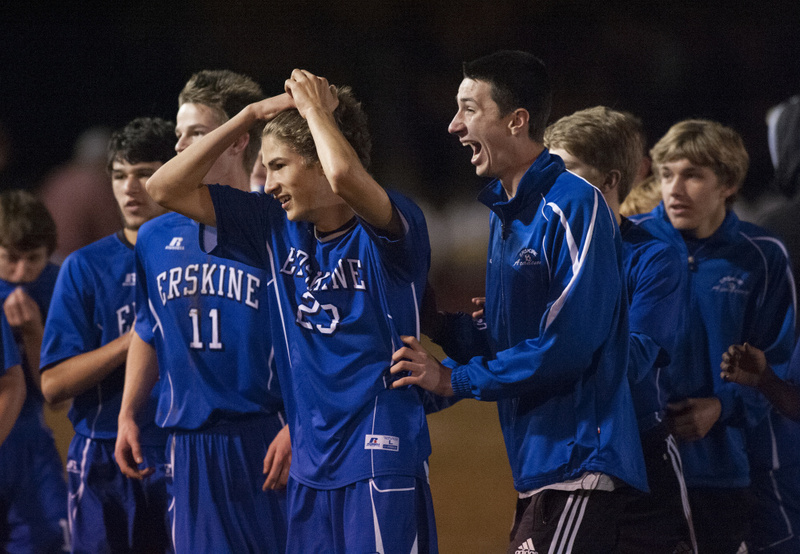 Ellsworth was unable to generate a scoring opportunity over the final 10 minutes, setting off a wild Erskine victory celebration. As soon as the clock hit zero, Erskine players and coaches were joined by dozens of Erskine students on the field.